For six or more months, the trees here are bare, the air sharp with cold and frost, the grass bleached under a shifting layer of snow, and the birds far far away. 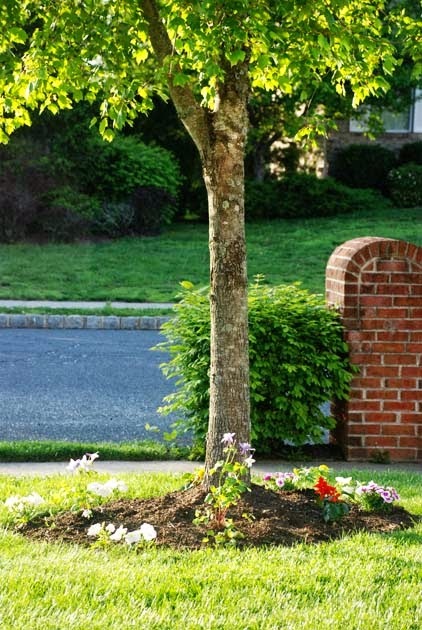 But when spring arrives, they all come back with a vengeance. The grass sprouts a bright green and the dandelions stand upright, their tiny yellow flowers looking boldly towards the brilliant blue sky. Yeah, they may be weeds, but so what ? It is spring, isn't it ? The leaves unfurl magically and all of a sudden the trees have a wild unruly head of green, like a little girl in need of a haircut. 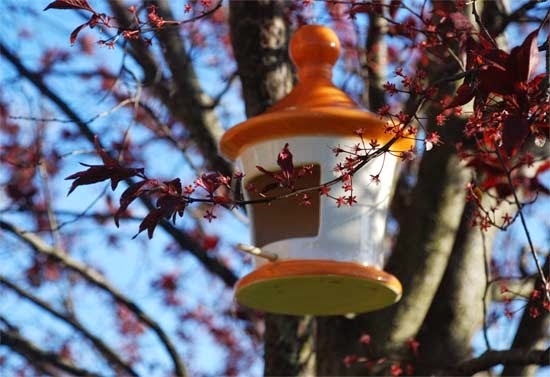 The birds arrive from God knows where and tweet urgently early in the morning. Tweet-Tweet.They continue their conversation throughout the day, short sharp busy tweets interspersed with slow lazy longer ones, talking of the far away land they visited and probably dissing those distant relatives who boarded them in winter.The flowers bloom in all colors, stretching their limbs, fresh and raring to go for a ball, after the long winter slumber. It all seems very fairy-tale kind. How did it all happen ? Who tapped the wand? I have been in this country for a fair amount of years now and yet every year Spring mesmerizes me.I am awed by the resilience of nature around me. Chin up, head held high, giving a repeat performance year, after year, after year. "This is our time and we will give it our best shot." They say. "We will pick the most vibrant of all greens in the palette, the brilliant of all blues in the paint box, the boldest red and yellow and purple of our crayons and we will paint a picture that you will carry in our heart even when the colors have wiped off and the canvas is white.And we will come back and do it again." 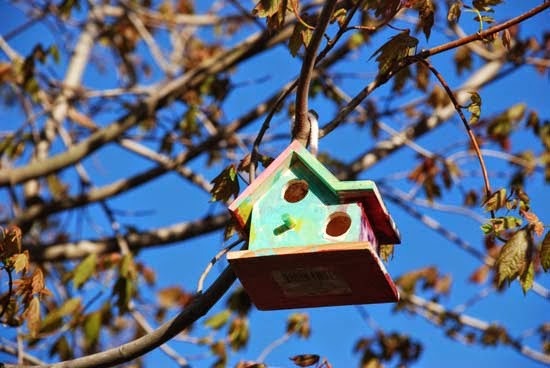 It is hard not to be carried away with such a show of fortitude and so I spend almost all of my weekends and afternoons, sitting outside, drinking my tea, admiring every weed and bud, and planting anything I can lay my hand on. I am hardly a gardener and so I choose the easy and hardy petunias or marigolds to color my garden. It is little that I do but there is so much joy to be just under the tent and play a tiny role in spreading that magic that it seems only fair to be outside. I am hardly in the kitchen therefore. Making quick easy meals is the call of the day. And this asparagus fits the bill perfectly. I never used to like Asparagus and I have to say it was my friend N's recipe which first pushed me towards trying it. It is so simple that it isn't even much of a recipe really. Once I got the hang of it, I experimented, doing this or that, still keeping it simple. 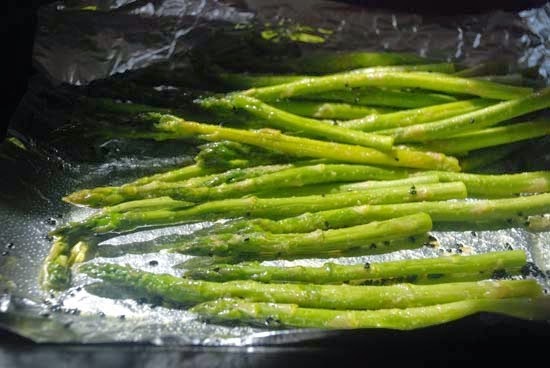 However I have a fondness only for the tender spears and once they get fat and chewy, I lose my interest in asparagus and prefer to wait until next year. 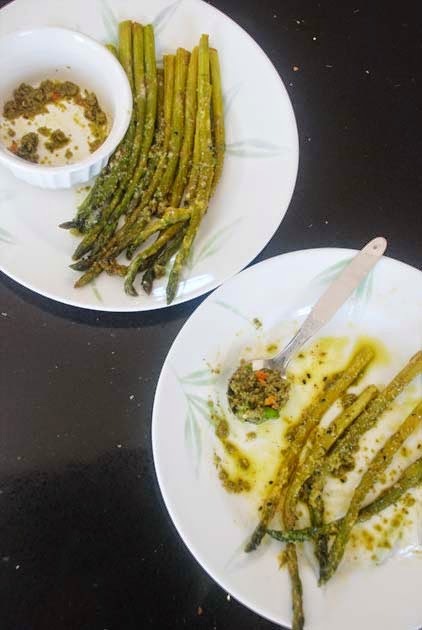 This particular recipe is for a Roasted Asparagus in the oven flavored with Nigella seeds, Kashundi and Pesto. 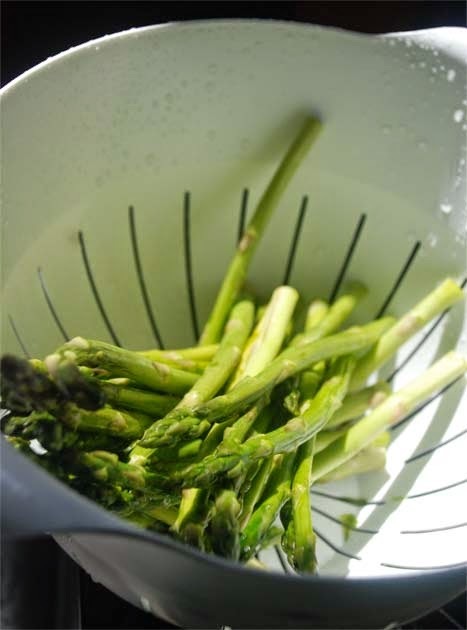 The key is to get fresh, tender asparagus spears. Which by the way can happen easily in spring. You then chop and discard the tough bottom portions. Wash them well and pat dry. Next take a shallow baking dish or foil covered oven tray and drizzle with 1-2 tbsp olive oil. Add 1/4 tsp of Kalo Jera/Kalonji to the oil and pop the tray in the oven for 3-4 minutes. Now take out the tray and arrange the asparagus spears in a single layer on the tray. Sprinkle a little garlic powder(very little). You can also use minced garlic. Drizzle a tsp of Kashundi. Pop back in the oven for say 15-20 minutes or so. Time depends on your oven power and the quality of the asparagus. There have been times when 15 minutes was enough for them to get cooked, while at times it also takes 25 mins. Once the asparagus are done, take them out and eat. We rubbed those cooked spears with some pesto+green chilli paste. It was so so good. 1. Though I try to send a wholesome lunch from home on most days, they are not spectacular by any means. In the morning rush, while I am warming and packing the thermos, I fail to take a pic of the said lunch, even if it is a phone pic. So on most days there is no living proof of the packed lunch. 2. The lunch I send is kind of repetitive. As in, it repeats every week or so. Big Sis wouldn't want to see any surprises at lunch. She is not the kind. A general idea of the lunches that I pack for the 10 year old is -- Pasta tossed with veggies and store bought sauce, pasta with veggies and olive oil, Upma, Leftover rice that has been stir fried and a side of yogurt, Stir fried Noodles, occasionally a Nutella sandwich, sometimes paratha and at times mini wontons or ravioli from Costco. 3. The 10 yr old also has a snack time sometime around 10 or 11 and for that I send one of these -- usually fruits(banana or berries), cheese and crackers, granola bar and sometimes store bought yogurt cups. 4. I usually have the lunch ready in portions the night before. The next morning all I have to do is heat and pack the thermos. 5. At least once or twice a week, Big Sis eats lunch offered by the school cafeteria. The menu is sent out at the beginning of the month and she picks days on which she thinks the food will be to her liking. The main complaint about the school food I have heard from her is that the portion is too less. I have not seen it and from the sound of it, it does look wholesome and appetizing (barring certain days). It might be a portion control thing which the cafeteria is trying to impose, which is not all that bad, but then again I cannot be sure unless I have seen the food. This week since we had too many loaves of bread in the pantry, I made this bread pulao for school lunch. My Mother, the avid snack and tiffin maker, would make this bread pualo very often. The husband-man has been so enamored by the idea after my Mother taught him, that he makes it often for weekend. 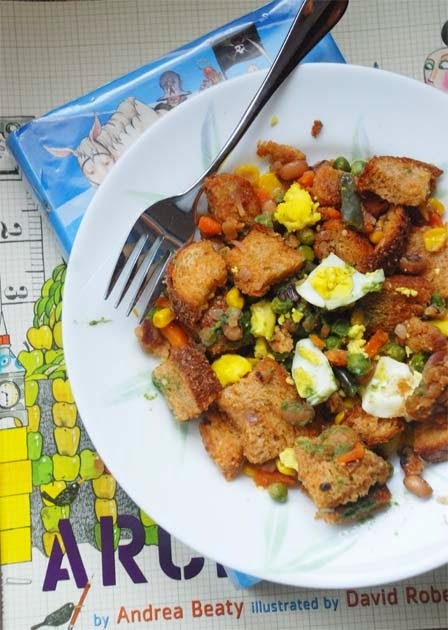 His version has sausages and eggs and is very filling.Usually we have it for weekend brunch but with the overload of bread, this pulao seemed like the right thing to do for school lunch last week. Big Sis's school has something called the "Battle of the Books" for which they have been reading a variety of books suggested and loaned by the teachers. I have not had a chance to read them and so she very kindly reviewed few of those books in my Kids' blog.If you are looking for book suggestions for 9-11 year olds, check them out. She promises to add more books to that list in the next post. 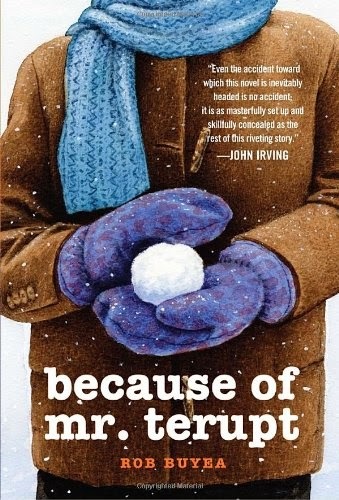 Do you have any book suggestions for 9-11 year olds ? Please add your suggestions to the list. Summer vacations are yet to happen here. Warm six slices of bread lightly. Then cut each bread slice in cubes. I leave the crust on and use whole wheat bread. Heat Olive Oil or any Vegetable oil. Then add some finely chopped onion and saute till onion is soft and translucent. While onion is frying, microwave a bowl of mixed vegetables. I use a mix of carrots, corn and green beans. You can use any vegetable you fancy. Once the vegetables are done, add the bread pieces and toss quickly with the vegetables and sauce. Now since I use whole wheat bread which doesn't get soggy, I drizzle about 2 tbsp of milk on the bread at this point. This helps the bread to soften a little. If you see bread pieces are coarse, you can also drizzle a little olive oil on them. Once I have tasted and checked to see everything is right, I add some parmesan and give the bread and veggies a last toss. On cooling, I pack it in portions for lunch next day. My Dad is a big health freak. He also has a huge sweet tooth. So he has convinced himself and everyone around him that eating sweets is healthy. Have you ever had the pleasure of feeding "high calorie-full fat-non vegan-decadent-deliciously- sweet-desserts" to someone who thinks it is actually healthy ? It is a shocking experience, I tell you. It gives you so much pleasure that you feel like you are doling out "world peace" by the quarts. You think you have a halo around your head and angels are practicing Mozart on their harp. That is what happened to me in the last few months while the pater was here. 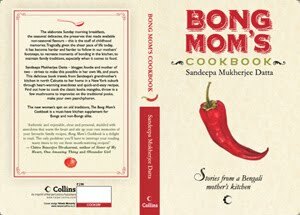 I made Mishti Doi or Bhapa Doi several times and then I made something similar, only with mango pulp and called it Aam Doi. 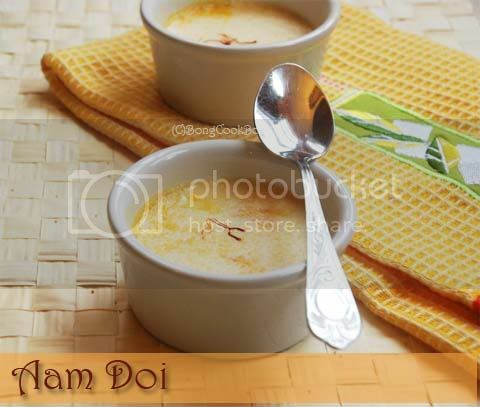 I have never tasted the real Aam Doi and I don't even know how the real one tastes. But from my previous attempts of mixing mango with the yogurt I felt a layering works and tastes better. That is the reason I like to make Aam Doi or Mango Flavored Sweet Yogurt in small ramekins perfect for single servings. If you are using regular low fat yogurt strain 1 heaped cup of yogurt on a strainer for 25-30 minutes till most of the whey has been drained. If using Greek Yogurt no need of straining. Now we can do this Aam Doi two ways. When Mangoes are in season, of course we will use fresh sweet mangoes. However when getting a mango is in your dreams, just get a Can of Mango Pulp. Check the sweetness of the yogurt mixture and add a little more condensed milk if needed. Add a couple of strands of saffron on top. Fill a oven proof tray half way with water. Put the ramekins OR the large bowl in it. This acts as a water bath. Put the tray+ramekin in the oven. Check in 30 minutes to see if the yogurt has set. Gently tap on the sides to see if yogurt has set. In most cases it will set in 30-35 minutes but may look a little wobbly. Note: Since we will be using Mango Pulp which has its own sweetness, I have used only 3/4th can condensed Milk. Check the blended mix for sweetness and add more condensed milk if you wish. Add about 1tbssp of mango pulp so that you get a thin layer of mango pulp at the bottom of each ramekin. Add the yogurt mix on top of this till each ramekin is filled a little below the brim. Add a couple of strands of saffron to each. Fill a oven proof tray half way with water. Put the ramekins in it. Put the tray+ramekin in the oven. Check in 30 minutes to see if the yogurt has set. Gently tap on the sides to see if yogurt has set. Put the tray+ramekin in the oven. Check in 30 minutes to see if the yogurt has set. Insert a fork gently or tap on the sides to see if yogurt has set.